I love getting to make birthday cakes, especially when it’s for one of my friends, and extra especially when the birthday party is a surprise but the birthday girl informs me herself that she wants a cake from me! Lol! My sweet friend Kim is amazing. She is the wonderful, supportive wife of the senior pastor of our church home in Niceville, FL. She’s an incredibly talented musician and self proclaimed doo-wop girl 🙂 So I was thrilled to get to the opportunity to not only make her cake but also to design it. The only instructions she gave me were to make it chocolate and have something musical on it. I love getting to design a cake for someone, because it’s an opportunity for me to create a one-of-a-kind cake just for them. But when I’m given complete artistic liberty, I get a little anxious. I mean what if I pick a beautiful color palette and then find out that the person hates that color! I like to have some kind of guidelines or inspiration to use as a springboard! Thank goodness for Kim’s daughter Kristen for picking out a fun and funky invitation that was the perfect guide for my cake! The invite had these great neon colored kaleidoscope-like star bursts on a black background that I just had to incorporate into my design. So after a few tweaks here and there I came up with a sketch that I thought was perfect. 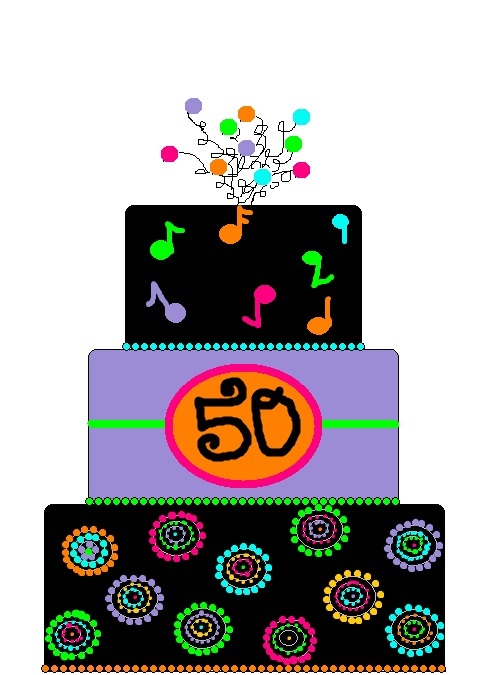 Sketch of the 50th birthday cake. 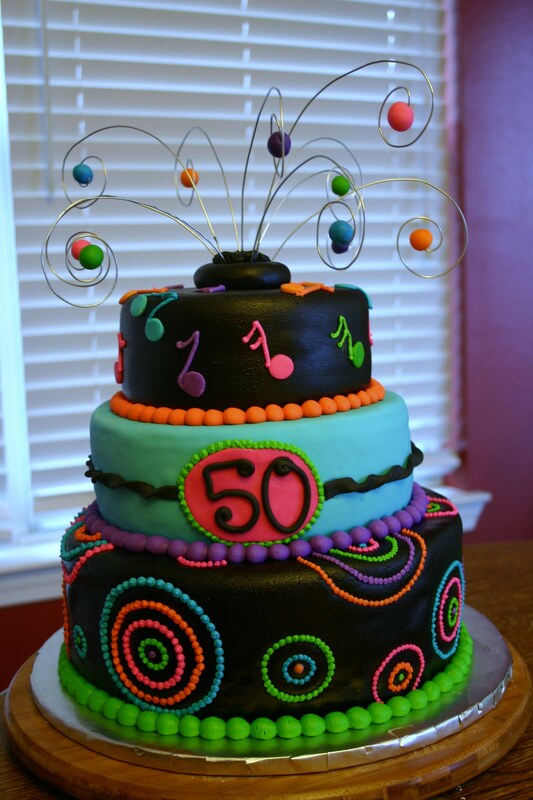 Kim's 50th birthday cake in black and neon! Feeds 50-60. MSRP $180. 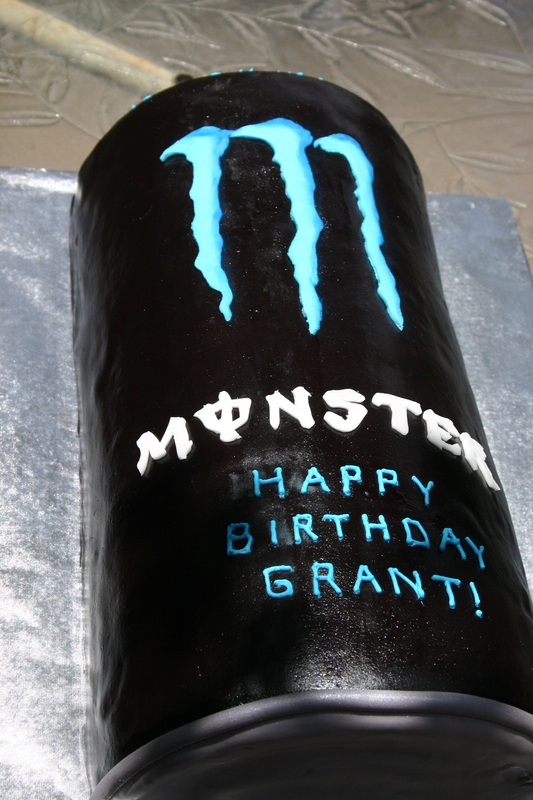 A Cake with Monster Energy! *Side Note* While searching Google images for other Monster Energy drink cakes, so I could see how others had constructed and designed their cakes, I found a cool Monster drink cupcake from a bakery in Michigan. It’s actually flavored with Monster! So what do you think, should I make an energy drink flavored cupcake? If so, what flavor would you like to see? I think Sobe Energize would be yummy! 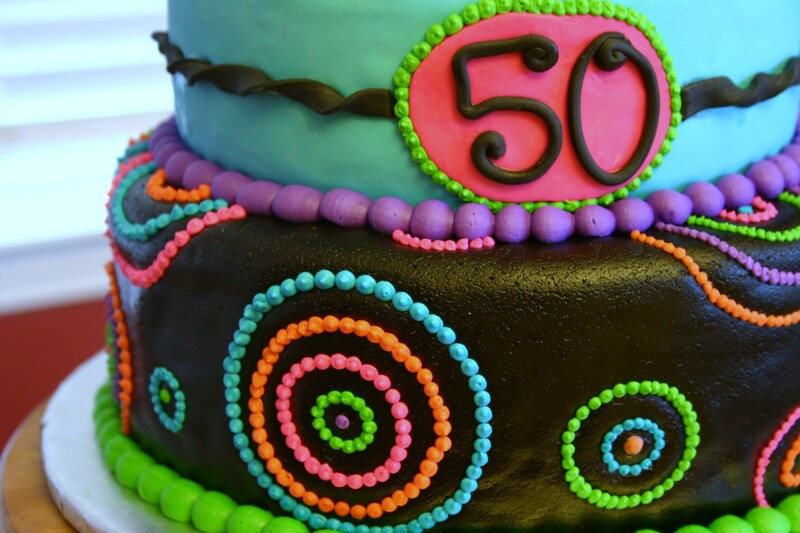 Like anything else, there are different trends that come and go in the world of cake. Right now the hot trend for girls is zebra print. Specifically zebra print paired with hot pink. And I have to say I love it! 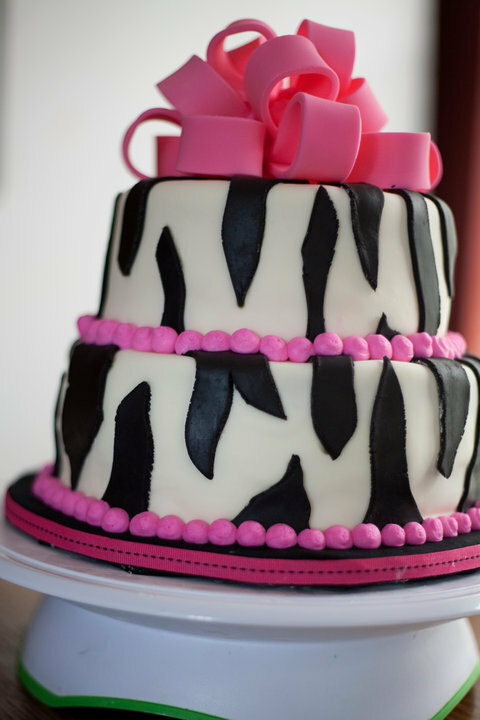 Here was the first zebra/hot pink birthday cake request I received from a long time friend for her daughter’s 12th birthday. 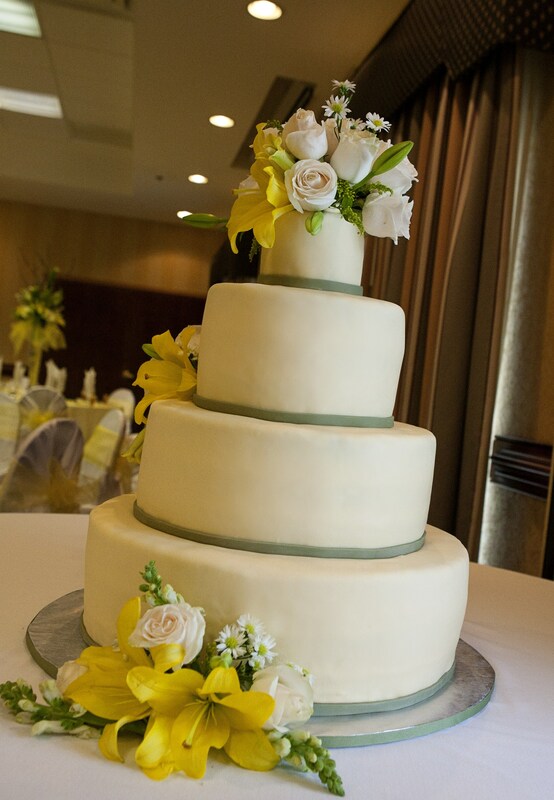 I love the clean, simplicity of this cake. 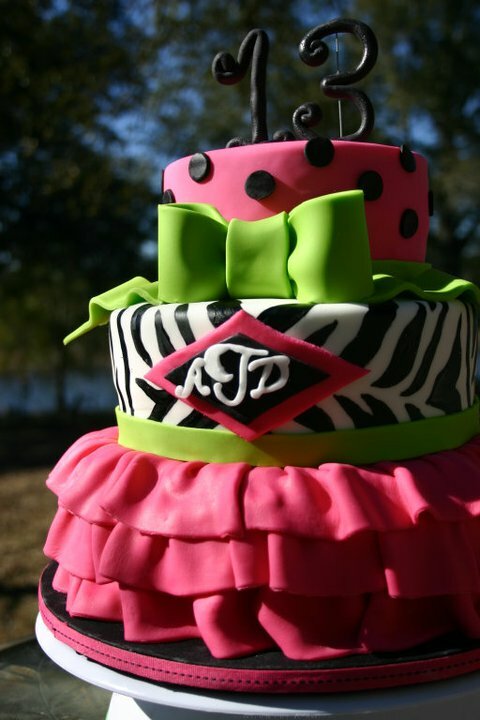 This features the hot pink and zebra trend in it’s purest form. And then there are those “special” clients that scare me a little with all the different elements they want on the cake. 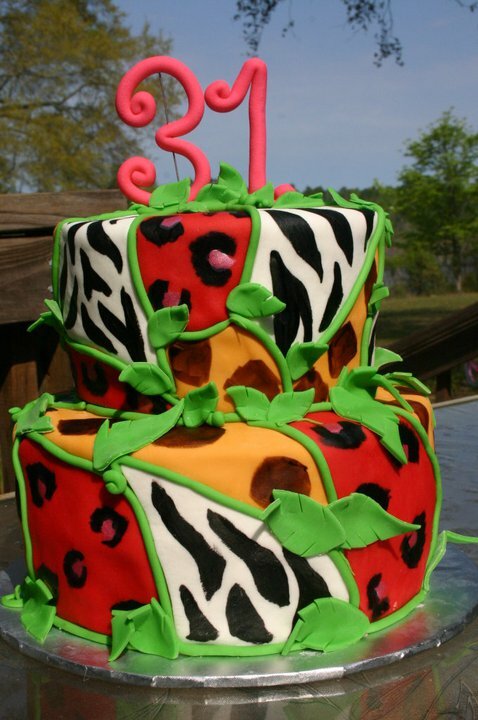 I want to make my client happy but I still want to make a beautiful cake, not like a jungle exploded on it! So these next couple of cakes stressed me out a little, and made me wonder whether my clients were schizophrenic! 😉 But in the end there wasn’t anything to worry about. The wildest and craziest of all was requested by a client that wanted to start a new trend. 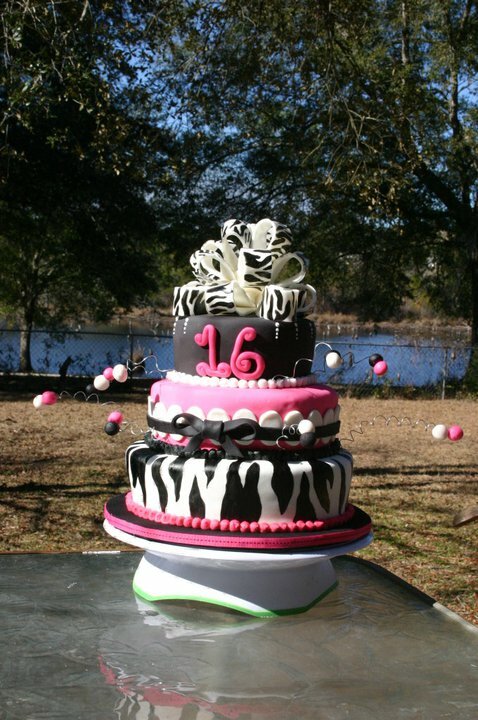 Her daughter’s 12th birthday had featured the hot pink and zebra theme and the following year they saw at least 3 other cakes with the same theme. So for her 13th birthday, they wanted something hot and new. Sticking with the animal print we went from zebras to leopards, and instead of hot pink we got electric blue. Well, you can see for yourself the amazingness that ensued! First I have to tell you a little about my husband, David. He’s a wonderful husband and father, but when it comes to giving him a gift for any occasion, he is a big pain in the neck! So this year, I skipped the stores, both in person and online, and instead I gave him some more unconventional gifts. The first, I cleaned out our closet 🙂 Hey, he loved it! The second gift was a gift of sacrifice. I joined him at his cult….Crossfit. (It’s not really a cult 🙂 Now you have to understand, I don’t workout. I mean, I kind of look like I do, but I don’t. I just watch what I eat and run around like a crazy person making cakes and chasing kids! So to say that I enjoyed getting up at 5:30 this morning to run, do burpies, step ups and a multitude of other torturous activities would be a complete and utter lie. I hated it! (Even more so now that every muscle in my body feels like its made of stone!) But I did it, at least what I could do of it! 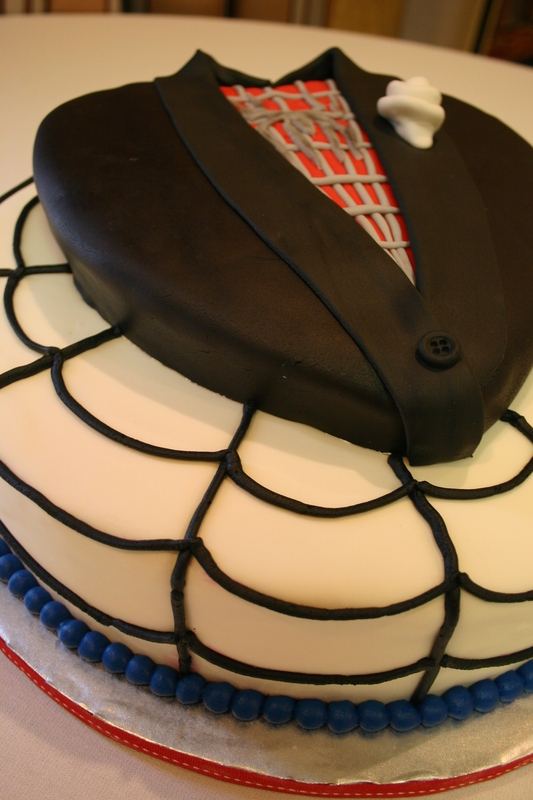 But of course I needed to get back home, because…… I had a special occasion cake to finish before church at 11:00! I thought I would have plenty of time to finish after our workout, but no it was an extra hard one, so instead of being gone a little over an hour, we were gone almost two! 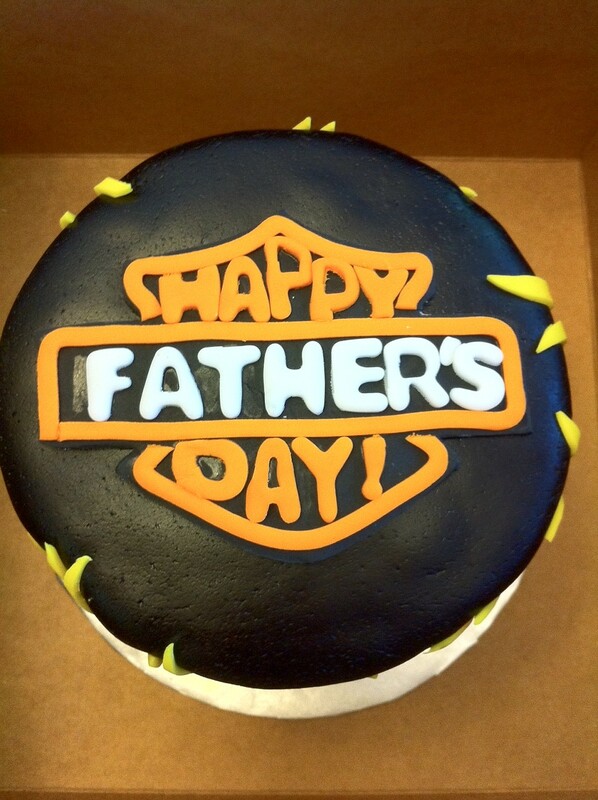 Ironically, the cake I had to finish was a Harley-Davidson themed Father’s day cake that my son’s teacher requested. Because I had a lot to do, I enlisted the help of my husband (since it was his fault I was running late 😉 to cut out fondant letters. 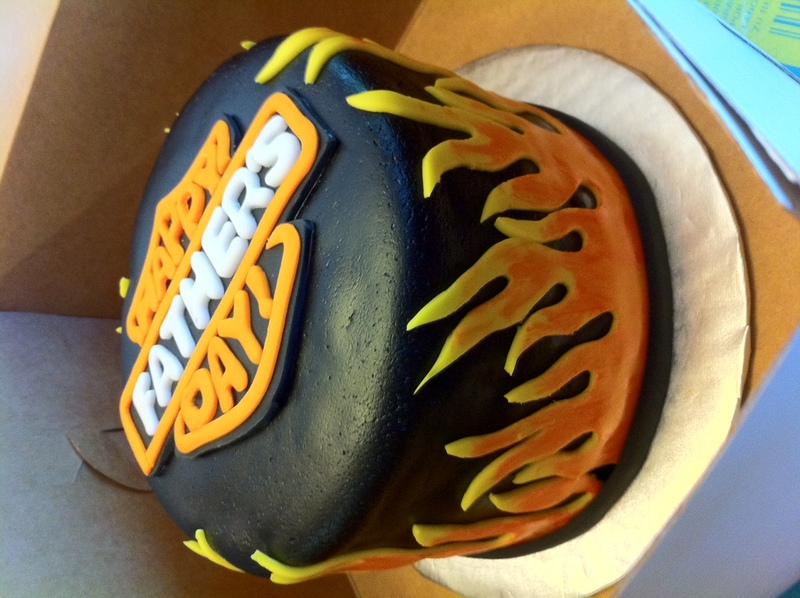 So I spent the last hour and a half before I had to leave cutting out fondant flames, attaching them to the cake and painting them; creating a fondant Harley-Davidson logo, and prepping my husband’s fathers’ day meal in the crock pot; while getting ready for church. Miraculously, we were only 12 minutes late 😀 And she loved the cake. Sorry about the lousy pics. We didn’t have time to take any, so my husband shot these with his iPhone! Lol. 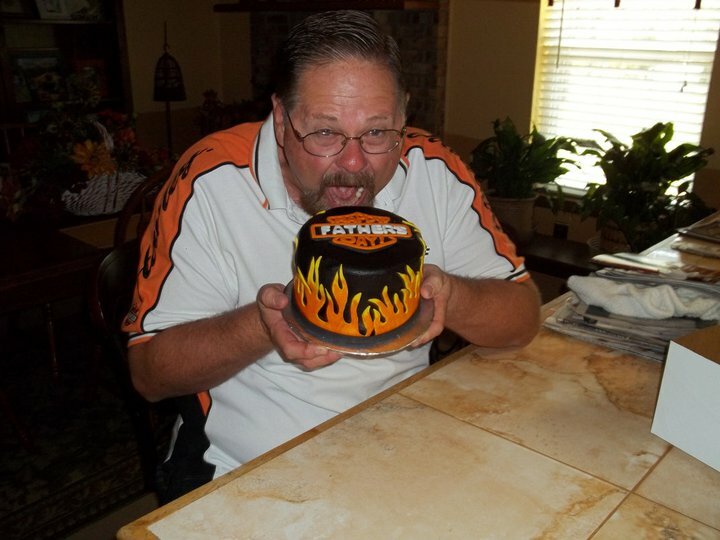 Customer's father enjoying his custom Harley-Davidson cake! I love a bride who knows what she wants! Mrs. Amber knew she wanted, something a little wonky, a little zany, and definitely unique. 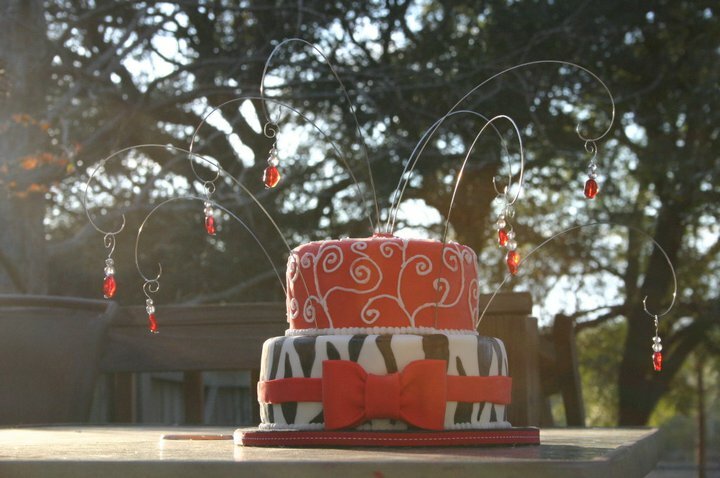 When we first spoke, Amber had several pictures of different whimsical wedding cakes. One was an inverted cake with the largest tier on the top and the smallest on the bottom; another had square tiers, and the final cake was a topsy turvy. 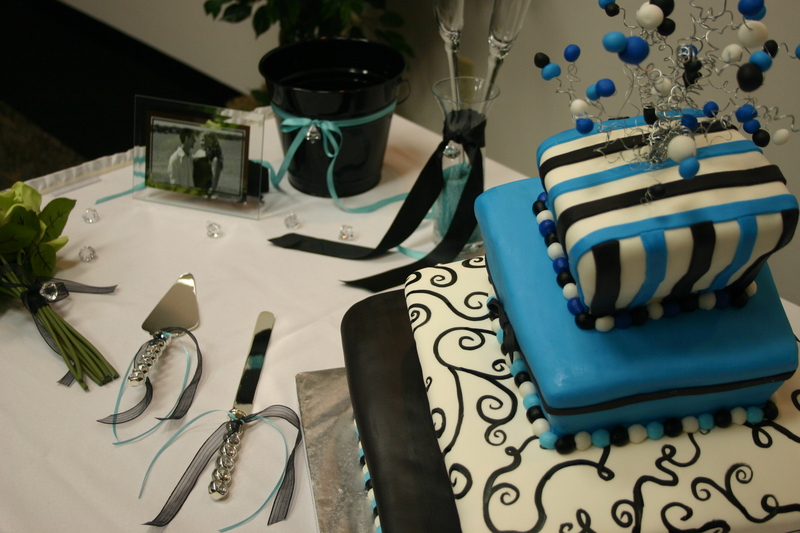 She preferred the square cake but her fiance preferred the topsy turvy. So I suggested she start her marriage on the right foot with a compromise. 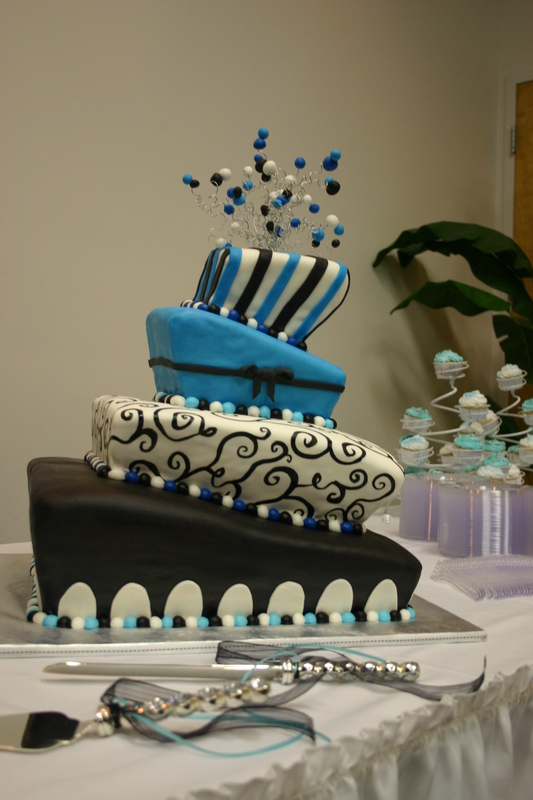 We decided to do the topsy turvy cake but with square tiers instead of round. 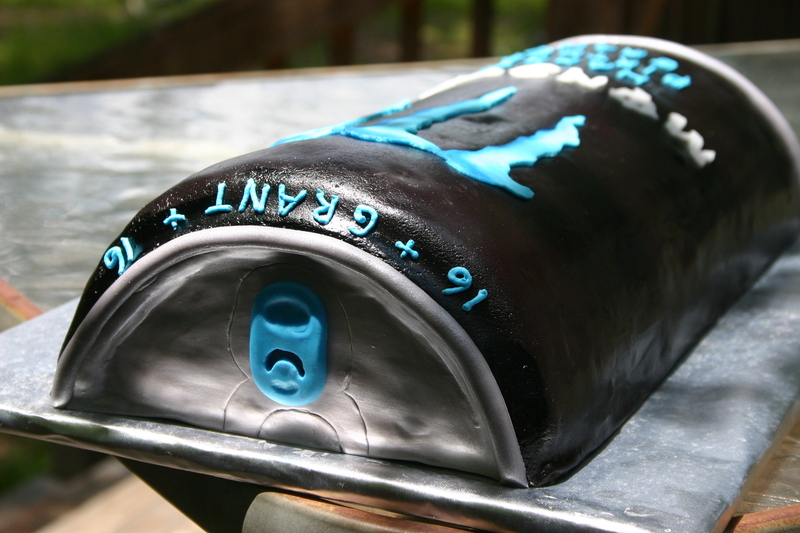 Now, this cake was challenging on several levels. First, it was HUGE! It fed well over 175 people. 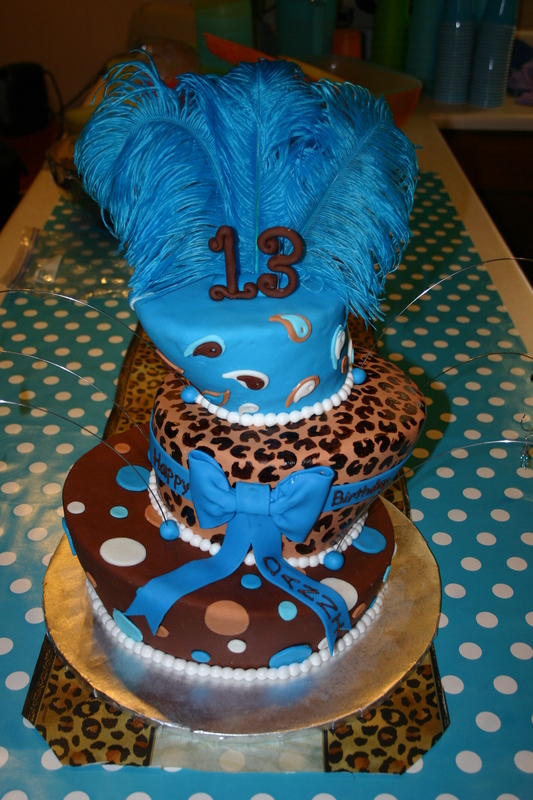 Second, I’d only done one other topsy turvy cake, and it was about 1/8 the size of this one and round. Finally, I had another wedding cake order that same weekend (I’d never done 2 weddings in one week! ), but you never know what you can do until you try! Right?! Oh and I also made the crazy topper! Whew…. Close up of topsy turvy wedding cake. Can you see the love in the cake? So I get some pretty interesting requests for cakes from Mini Coopers, to pirates, to pink-polka-dotted guitars. And I have to admit I do appreciate a customer who knows what they want! 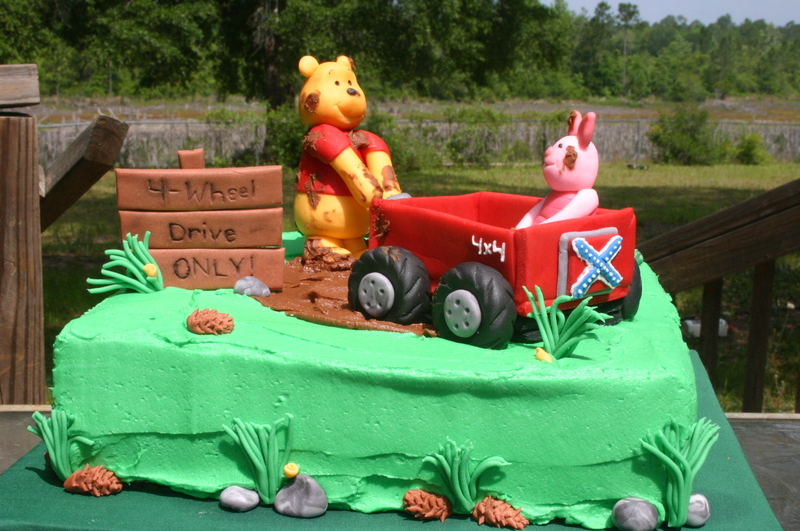 But when I got a request for a baby shower cake featuring Winnie the Pooh pulling Piglet in a wagon decked out with mud tires going through I mud puddle, I was a little skeptical! First of all, sculpting iconic characters like Winnie the Pooh always stresses me out. Because everyone knows what Pooh looks like, so anything missing the mark ends up looking like a distant relative of Pooh. Like his 3rd cousin, once removed, Whiney the Poot! It’s just really hard to get it just right. Well Jesus must have been with me that day 😉 because my figures were spot-on! In fact, one friend commented that at first glance she thought they were made of plastic! After the time that guy ate a piece of my cake off the ground, this was the best compliment anyone had ever given me! I modeled the cake after a fishing themed cake that I made several months ago. But instead of the scene looking like a swampy pond, I made it look more like a forest meadow. 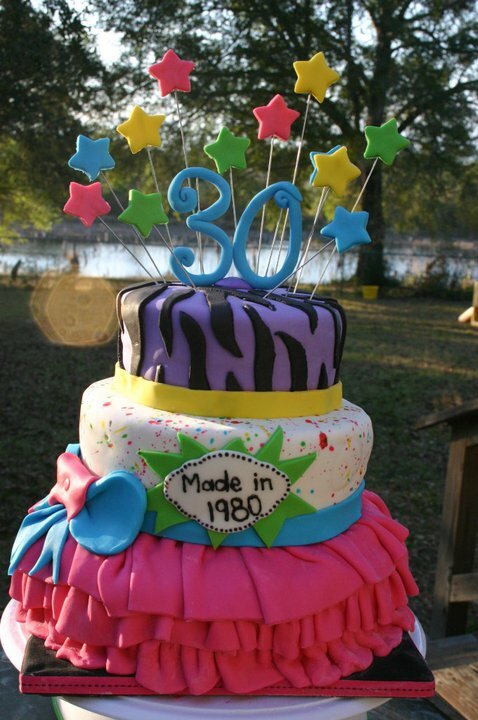 Special props go out to my dear sister Crystal who assisted me with the cake, since it was my first cake since my surgery a month ago. She put up with me bossing her around like a champ! The cake itself was a buttermilk vanilla cake with vanilla and chocolate buttercream frosting. All the characters and embellishments were made from gumpaste. For more baby shower cakes click here. 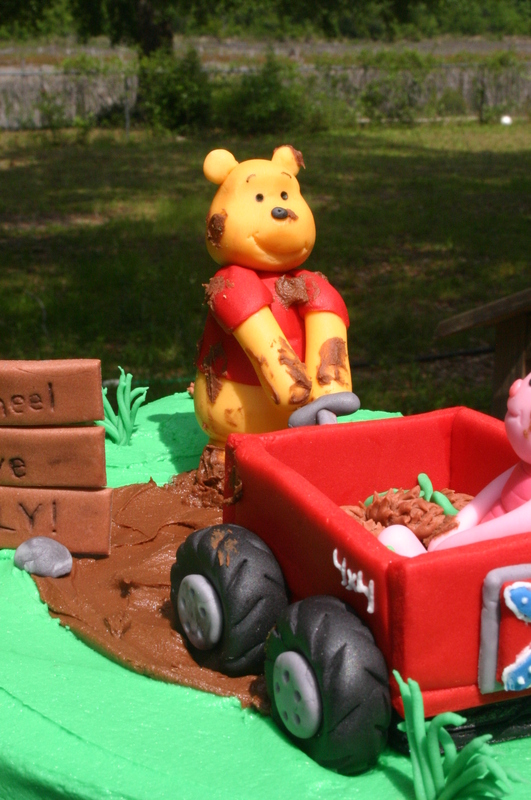 Winnie the Pooh baby shower featuring a Piglet in a "Mudding Wagon"
Close up of Winnie the Pooh pulling the "Muddin' Wagon"! 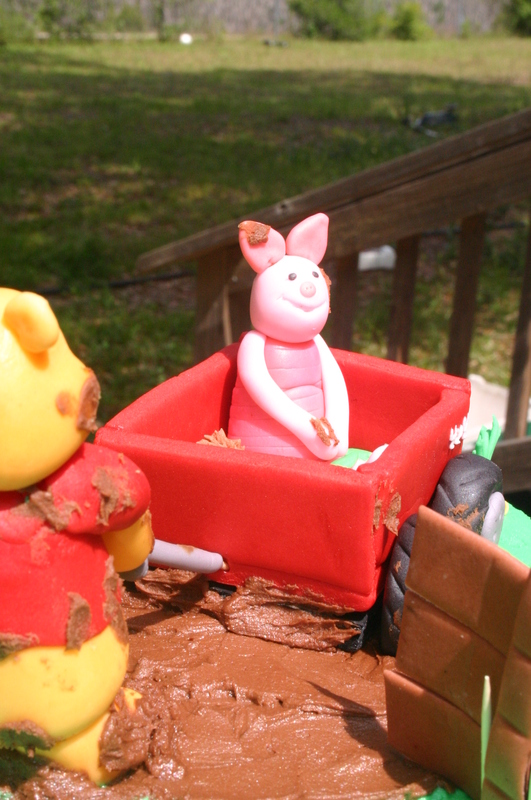 Close up of gumpaste Piglet in the wagon.